Sometimes, all it takes to brighten up your day is a reassuring touch from someone who matters. But we can’t all be close to our loved ones 24/7, and it’s during times like these that devices like the Tactilu really come through as lifesavers. 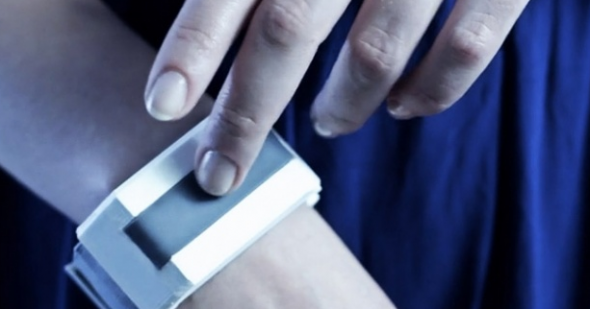 The Tactilu is a device that’s meant to be worn around your wrist like a bracelet. It’s powered by an Arduino Pro mini microcontroller with a custom pcb and a Bluetooth module, and it communicates to partner devices through haptic feedback via Bluetooth or through the Internet. This means that you’ll be able to keep in touch literally with your significant other, no matter where you are in the world or how far you might be from him or her. The Tactilu project is described as being “based on technologies like flexinol wire for actuation of touch and QTC (quantum tunneling composite) on the touch sensor layer.” It was developed by Polish design studio Pangenerator in collaboration with the Polish bureau of Cheil for ITAKA Foundation – Centre for Missing People. News: Lumigrids bike light system.